Potash, if you don’t already know, is a critical ingredient in plant fertilisers — one that has helped farmers throughout time achieve greater crop yields. With rising populations there is a long-term need to find ways to increase the world’s food supply. Potash plays an important role here — a vital piece in solving the dilemma of feeding the world’s growing population, which is growing at 80 million a year and estimated to reach 9.3 billion by 2050. There are a number of factors that should see continued rising demand for potash — of which 95% is used to fertilise crops — there’s the fact that the world’s population continue to grow, along with the urbanisation of populations, and the growing uptake of western diets. All this adds up to greater demand for food and less arable land on which to produce it. This is where potash comes into play. As a fertiliser, potash is a crop nutrient that improves the production yields of agricultural crops. It improves a plant’s retention of water, nutrient value, taste, colour, and resistance to diseases and pests. The current potash market is now emerging from a period of oversupply with demand growing at 3% a year and is expected to reach a record 61-64 million tonnes this year. This has led to a price recovery as inventories reduce and the market returns to balance. BHP is one big name that has recognised this opportunity in the potash market and intends to start potash production from its Canadian potash project in 2023, with the goal of producing 4 million tonnes annually. The $86 billion company had earlier made an (unsuccessful) bid for the world’s largest fertiliser company — Potash Corp in Saskatchewan, Canada. BHP estimates that the growing demand for higher-quality food combined with the shrinking availability of farming land will grow global potash demand by 2-3% per year. Another macro factor to consider is that the supply side dynamics are also on side, with only a limited number of players capable of bringing on additional potash production capacity. Given these supportive economics, today’s micro-capped ASX-listed company is looking to revive a potash region with a long and successful history of potash production... and an even more promising looking future. 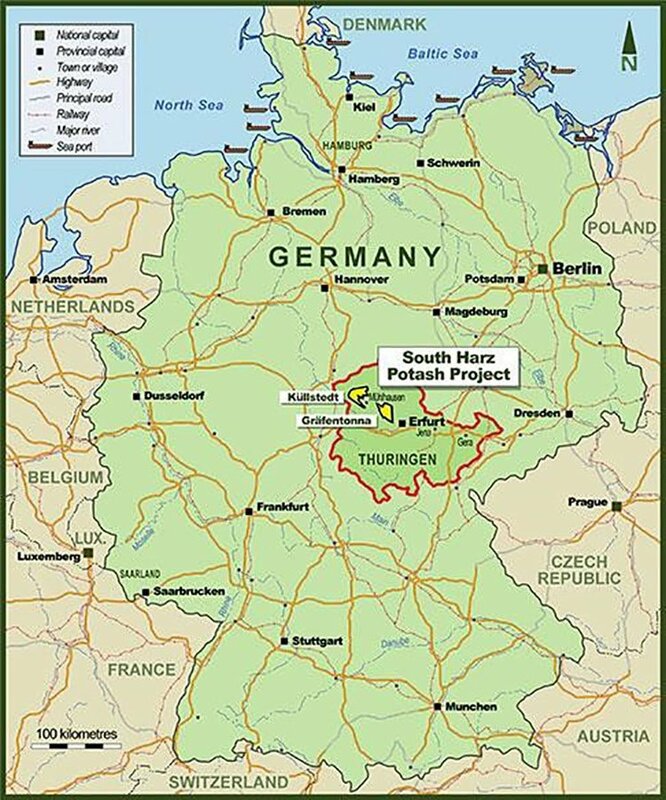 That region is Germany’s South Harz Potash District, which has the potential to help supply agricultural markets with a steady supply of potash and where today’s company is set to acquire three perpetual, extensively drilled Mining Licences containing historic potash resources. The acquisition will also extend this company’s strategic landholding in one of the world’s most prolific potash basins to more than 650km 2. The licenses equate to €100 million in sunk exploration costs at today’s value and contain well understood areas of high grade sylvinite potential which augurs well for the future. Of course this is an early stage play and investors should seek professional financial advice if considering this stock for your portfolio. Potash has a long history in Germany, inconveniently interrupted by both World Wars. Up until the 1860s, the only known sources of Potash for farming were hardwood trees and a couple of other plants. That was up until natural deposits of potash were discovered in dry lake alkali beds in Germany. Yet this potential supply from Germany was disrupted upon the outbreak of World War I, which forced other countries including Russia and France to develop their own fertiliser sources. Later in the 20 th century, Germany’s Harz district blossomed to become renowned for its potash production — all up until Germany’s reunification some 25 years ago. Since then the district has more or less remained dormant ... all the while sitting on highly promising historic data, awaiting an enterprising explorer to return the region back to production. Today’s small-cap Aussie company has the potential to do just that, with two exploration licences backed by strong historical data in Germany’s highly promising South Harz District and now three mining licenses, the company can now look to progress towards production. Davenport Resources’ (ASX: DAV) is an $11.7 million micro-capped Aussie explorer. DAV became a separate ASX listed company early this year, when it was spun off from Arunta Resources (ASX: ARN). The company currently has two promising exploration projects on the go — each supported by strong historical results, yet varied by location and the commodity being targeted. The first is its South Harz potash exploration project in Germany, as alluded to above. DAV holds two exploration licences and is now set to acquire three extensively drilled Mining Licences at the South Harz Potash Project in the state of Thuringen, in central Germany. That South Harz Potash Project can be seen outlined on the map below in the northern part of Thuringia state. Dav’s second focus is set on its copper-gold exploration project in the Northern Territory, the Southern Cross Bore Project, for which DAV holds two exploration licences covering an area of approximately 650 square kilometres. Before we get to the local project, let’s dig a little deeper into the potash potential on offer in Germany and its most recent news – the pending acquisition of highly prospective potash mining licences from the German government. Through its fully owned German subsidiary East Exploration GmbH, DAV has signed an agreement with Bodenverwertungs-und-verwaltungs GMBH (BVVG), to acquire three highly prospective potash Mining Licences in the South Harz region of Germany. Bodenverwertungs-und-verwaltungs GMBH (BVVG) is a German government agency charged with divesting former German Democratic Republic (GDR) assets. The three licences – Mühlhausen-Nohra, Ebeleben and Ohmgebirge are unique and valuable, being perpetual mining licences granted under the former GDR system. What this means is DAV will have its hands on assets that are neither subject to expiry, rent, royalties or reporting requirements of the current German tenure system. They are however subject to the usual environmental laws and mine development regulations that apply in Germany. The following map details the newly acquired mining licences, close to the existing exploration licences. All three licences have been extensively drilled with historic resource estimates that date back to the GDR era when potash was actively mined in the South Harz region. In total, more than 100 deep drill holes were sunk on the licences in the GDR era, leading to the creation of an extensive exploration database that would cost in excess of €100M to replicate based on current industry costs. This information will allow Davenport to fast track cost-effective brownfields evaluation of the area with the aim of reinvigorating the South Harz as a globally significant potash producing region. Following the acquisition, DAV now holds exploration licences and perpetual mining leases covering well in excess of 650km 2 in the South Harz. The Company has prioritised areas for systematic data analysis and results will be released to the market at each stage. You can find a breakdown of the licences in the latest announcement . a €50,000 non-refundable deposit payable on signing of a sale and purchase agreement. At this point Davenport receives immediate access to all historic exploration data. Subject to final formal approval of the transaction by Government agencies including the mining authorities (up to two months after signing of the agreement), Davenport pays €700k second instalment. Six months after registration of ownership of the licences to East Exploration GmbH (100% owned by DAV), Davenport will pay the final instalment of €450,000. DAV will soon begin a comprehensive and staged work program of data evaluation with consultants ERCOSPLAN. Work will commence as soon as the company gains access to the historic exploration data and be prioritized by area with reporting milestones over coming months. First results are expected within weeks and will be reported as work progresses. 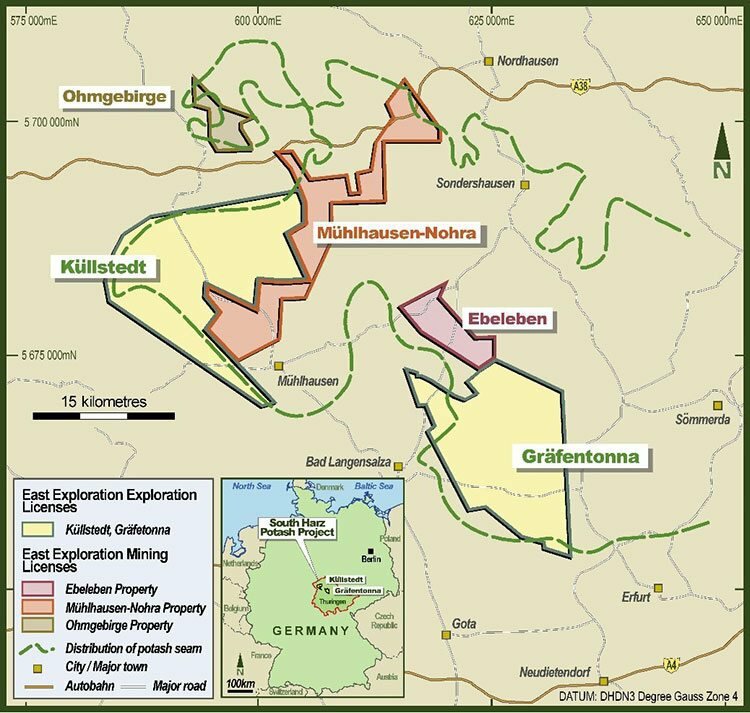 This program will cover all three new licences, however, the immediate priority will be the subfield Mühlhausen as it contains areas of sylvinite mineralisation that extend into Davenport’s adjacent Küllstedt licence. Drilling conducted within the subfield Mühlhausen and the Küllstedt exploration licence was completed during the same 1970s drill program. Davenport anticipates that once the existing data has been analysed, carefully located confirmation drill holes can validate the entire 1970s drill program and bring it into a JORC 2012 resource. The initial data review for the subfield Mühlhausen will be carried out concurrently with ongoing drillhole permitting for the Küllstedt exploration licence. DAV’s two exploration licences are made up of two exploration licenses — covering a total area of approximately 457 square kilometres — the Küllstedt licence and the Gräfentonna license. These two exploration licenses are granted for a term of five years with an option to renew for a further three years, as is the practice under the German Mining Law. The project is located in a renowned German mining district that has a history of producing Muriate of Potash (MOP) from both Sylvinite and Carnallitite ores, producing over 180 million tonnes of potash from underground mines between 1880 and 1993. MOP is another name for potassium chloride, which is the most common source of potassium used in agriculture. Historically, potash ores were mined by both conventional underground as well as solution mining operations. Potash mining in the South Harz Potash District got its start back in 1888 when the first exploration hole was sunk. Extensive exploration for potash followed, resulting in the development of a number of successful potash mines. Prior to the reunification of Germany, the district — which was in the former German Democratic Republic — produced approximately 3.5 million tonnes of K2O annually, or approximately 4.4 million tonnes of MOP. Yet, since German reunification the South Harz Potash District hasn’t been mined for potash ores and the last active mines and potash processing plants were closed and decommissioned by 1993. Today, the only remaining potash production in the district is the DEUSA International GmbH, Kehmstedt solution operation. DAV plans to change that ... and is now close to gaining drilling approval with the eventual goal of progressing to production and taking advantage of the favourable potash economics. After Davenport’s IPO in January 2017, the company commissioned a detailed review of the extensive historical geological and exploration data from work carried out on and around the DAV’s exploration licences. On May 15, DAV announced that its Küllstedt licence at its South Harz Project has further progressed towards drilling approval . Local government meetings that had earlier delayed the approval have now been completed and the environmental impact assessment is due for completion this month and will form part of the information required for approval. The final drill tender evaluation is now underway after the company received responses from several experienced European drilling companies. This follows on from historical exploration, where a total of 34 potash exploration holes were drilled at the Küllstedt licence area over several phases through to the late 1970s. This historic information has been analysed by DAV’s consultants, ERCOSPLAN, arriving at an Exploration Target with an estimated 4.055 to 5.141 billion metric tonnes, grading between 7.2% and 25% K2O . In an important step on its way to upgrading part of the project area to a JORC Resource, DAV is working on getting drilling approval to drill up to four new holes in the Küllstedt licence as it attempts to verify the historic data. Of course there is no guarantee that it will be able to verify the data, so investors should approach their investment decision with caution and seek further publicly available information before making an investment decision. Prior to listing, DAV undertook a $5 million capital raising to provide the financing needed to complete drilling programs at the Küllstedt licence with the aim of confirming a maiden JORC compliant potash resource. DAV is also working to obtain permitting for its second licence at South Harz, Gräfentonna, which covers 216 square kilometres. On May 22, 2017, DAV announced the estimation of an Exploration Target on its Gräfentonna licence is now complete. 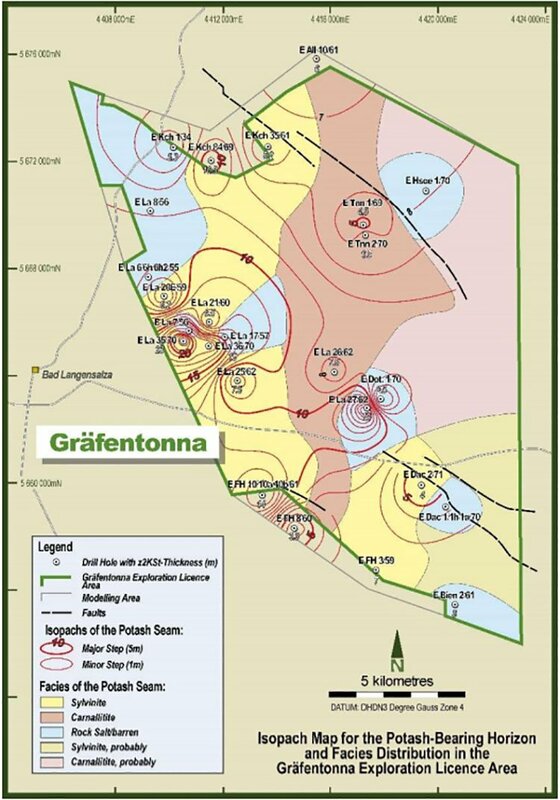 The Exploration Target estimate at Gräfentonna is between 2.678 and 3.396 billion metric tonnes at a potash grade between 4.3% and 25% K2O . This average density of the Exploration Target varies between a minimum of 1.83 t/m3 and a maximum of 2.32 t/m3, depending on the mix of potash bearing salts on the potash horizon. This data incorporates potash and oil drilling carried out between 1960 and 1985. These targets will be added to the South Harz inventory for prioritising and planning drilling programmes to achieve a JORC compliant resource on this project as soon as possible. There has been insufficient exploration so far to be able to estimate a mineral resource and while the project looks promising, there are no guarantees that further exploration will result in a mineral resource estimate. The company continues to work closely with regional and state mining authorities to complete the necessary approvals to move to the next evaluation stage of drilling so that it can confirm the promising historic data from the district. DAV’s consultants, ERCOSPLAN, have completed a detailed analysis of the potash basin underlying the Gräfentonna area. The work includes modelling the basin and potash horizon architecture and analysis of previous drill holes on the licence. 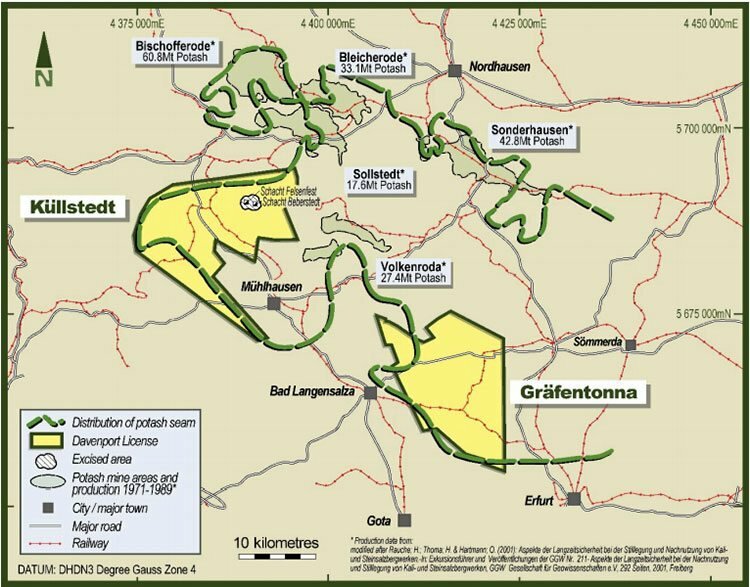 Most of the historic drill holes at Gräfentonna were for hydrocarbon exploration, combining that data with the consultant’s extensive knowledge and database of the characteristics of the Harz region’s potash-bearing horizon, it was sufficient to establish the Exploration Target. After a decade of falling prices it looks like potash is making a comeback. This was always likely to happen as the low prices were cyclical and a result of excess production scheduled to be brought online back when prices were more attractive. 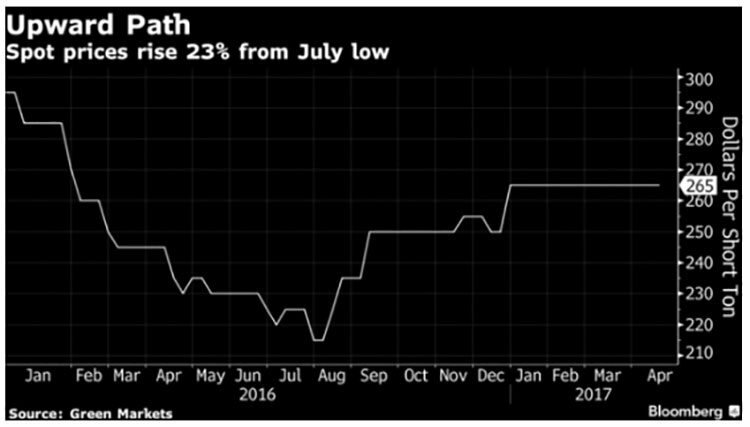 The following chart highlights the recovery underway in potash prices (through Aril 2017), following July 2016 lows. Yet commodity prices do fluctuate and caution should be applied to any investment decision here and not be based on spot prices alone. Seek professional financial advice before choosing to invest. The world’s largest potash producer, Potash Corp., anticipates worldwide potash shipments of as much as 64 million metric tons this year, up from 60 million in 2016. 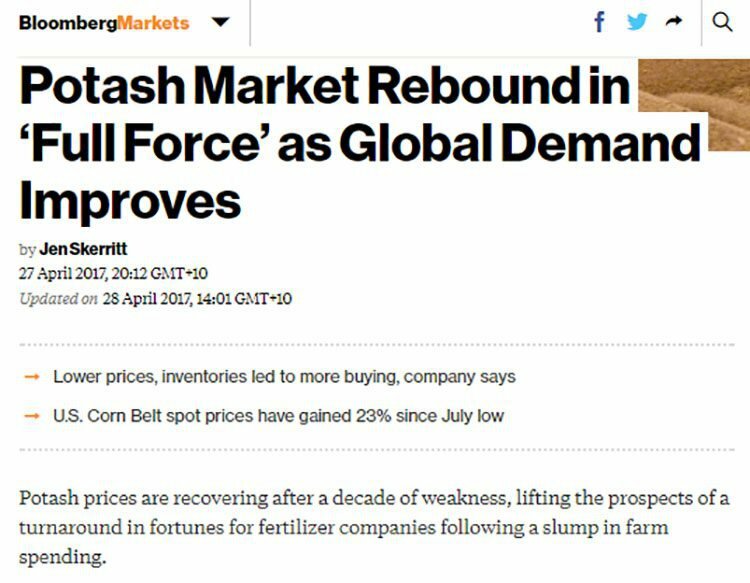 Of course commodity markets are cyclical, but taking a long term view, potash has all the drivers to see its price continue to rise. Demand for potash will be driven by rising global population, accelerating economic growth and increasingly urbanised populations, growing demand for biofuels, improved affordability and lower inventories and growing demand for agricultural crops like palm oil and rice. 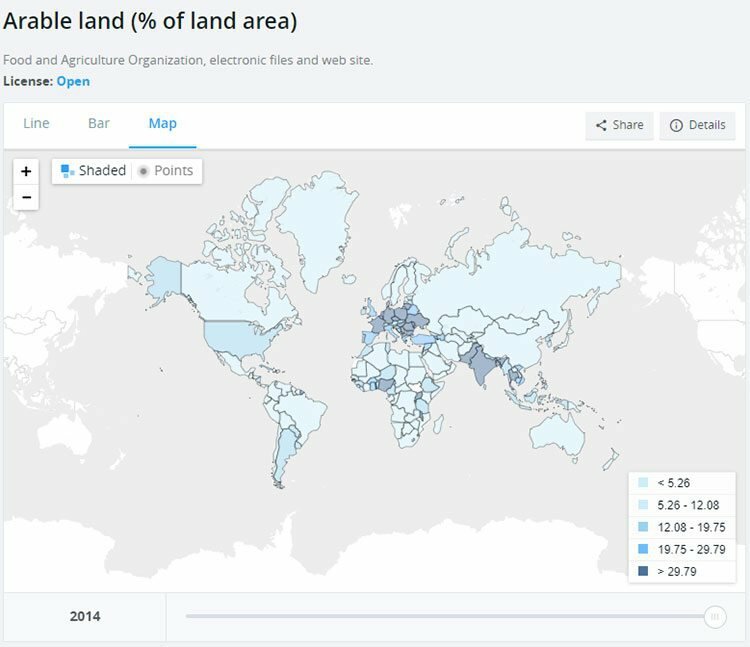 Click on the following chart to play with the WorldBank’s nifty interactive tool that shows how the world’s arable and agricultural land has decreased over time. Back on home soil in Australia, DAV is recommencing exploration work at its copper-gold Southern Cross Bore Project in the Northern Territory. 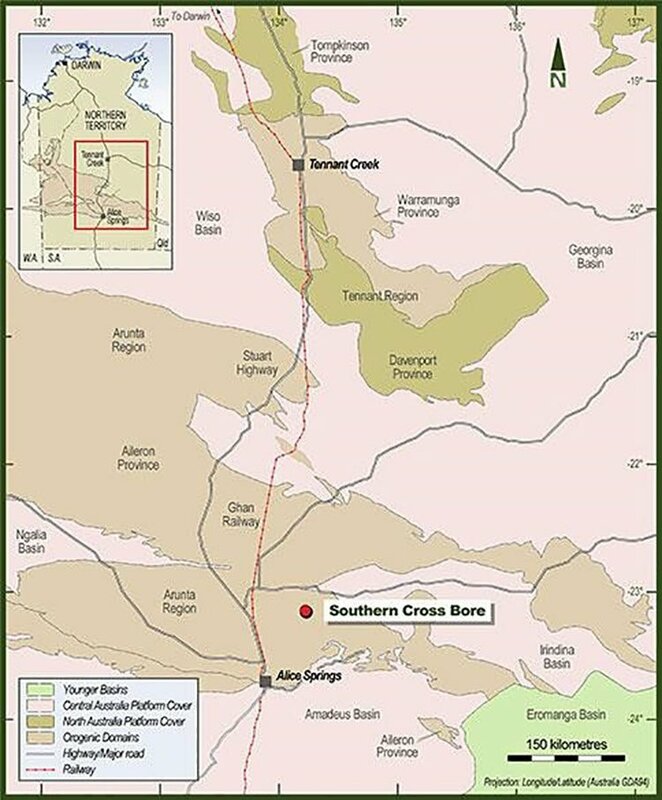 The Project is located approximately 75 kilometres north of Alice Springs and comprises two exploration licences covering an area of approximately 650 square kilometres. As you can see below, the Project is located near major highways and the railway connecting Darwin and its ports to Adelaide. The Project, which is prospective for Iron Oxide Copper and Gold (IOCG) style mineralisation has seen limited exploration activity since 2014, yet it offers the opportunity to follow up on some excellent drilling results returned in previous work. Past exploration suggests that the Johnnies Reward–Brahman-Black Angus trend is a continuous magnetically anomalous trend and has not been adequately drill tested along strike or at depth. DAV will do this via re-interpretation of existing geophysical data, correlated to the geological information from several drilling and soil sampling programmes. The company has commissioned Southern Geoscience to re-interpret the airborne magnetic/VTEM survey over Johnnies Reward and integrate it with known geology to produce a litho-structural model of the area. Significant results were reported from the first program, seen in the graphic below, and included the gold and copper results in the table that follows. 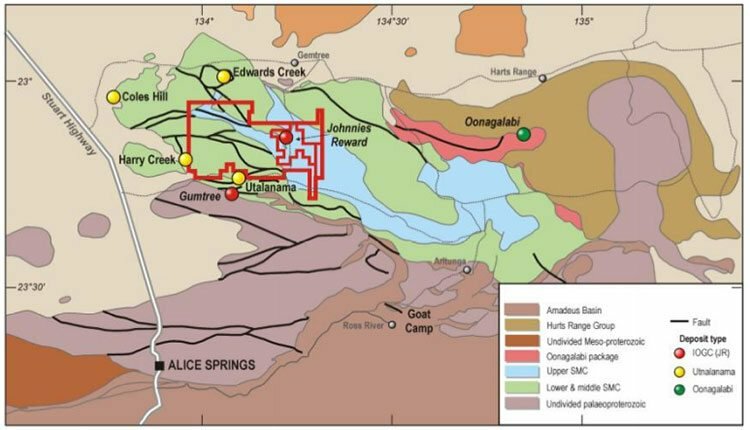 Before DAV became a separate ASX listed company early this year, Davenport was the tenement holder and Arunta undertook a number of successful exploration programs on its behalf, with a focus on the Johnnies Reward prospect. Drilling by DAV in 2012 and 2013 intersected significant mineralisation and built on historic drilling at Johnnies Reward. The drilling intersected contiguous mineralisation open along strike and down-dip. 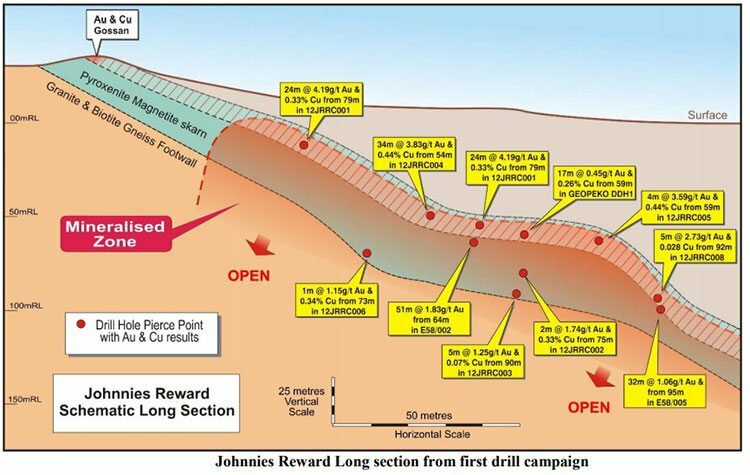 It is anticipated that this work will open new targets along the Johnnies Reward trend and at depth where mineralisation remains open. It will also be used to plan a new aeromagnetic/VTEM survey to find new unexplored magnetic and structural trends prospective for IOCG mineralisation in the larger surrounding licence EL30090. DAV’s EL30090 surrounds EL28045 and extends to the west covering similar but largely unexplored geological terrane. Much of the historic work across this licence was stream sediment sampling for diamonds. Some of the results suggest prospectivity for IOCG targets, but there hasn’t been any recent follow up exploration and DAV is further analysing these historic results. While DAV is progressing with follow up work on some excellent drilling results from past drilling at its Northern Territory Project – which intersected several intervals with significant copper-gold values – it is its foray into German potash that could hold the real key to the company’s future success. With five licences to soon be in hand, including three mining licences, DAV is quickly scaling up its operation. DAV has confirmation that the known potash horizon in the South Harz basin and in both of DAV’s exploration licences — Küllstedt and Gräfentonna — is extensive and certainly warrants progressing to the next stage of evaluation. These two exploration licence areas at the highly promising South Harz Potash Project in Thuringen, central Germany. As are its soon to be acquired mining licences which could have the potential to help supply much needed potash as the world’s demand for food and agricultural product continues its rise.